After rolling around for 10 minutes, I had to agree with my friend and decided to register my concerns with the organizers on-site and with the Brooklyn Bridge Park Conservancy. This afternoon I was pleased to discover that my complaint was taken seriously. The two barriers that I was most concerned about were completely addressed. 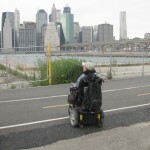 Thank you Photoville, Brooklyn Bridge Park in the BBP Conservancy for responding and creating an accessible event! 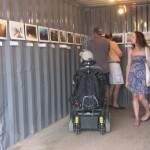 Without turning this posting into a complete recitation of my concerns and what transpired, there was more than a 2-inch drop down to get into the exhibit from the bike path and the cargo containers where the photos were being displayed all had a step. As you can probably imagine, I was quite annoyed with this discovery. While I appreciate that Dave from Photoville was trying to assist in offering to help with my wheelchair into the containers, is simply not a good idea. Lifting a 400-pound wheelchair is dangerous at best and is only acceptable under the Americans with Disabilities Act in the most extreme and unusual circumstances. When I got home later that evening, I wrote an email of complaint outlining the barriers. As I arrived at the exhibit today, I really did not know what to expect. On the one hand, people had assured me that the problems would be fixed. On the other hand, reasonable plans to address wheelchair accessibility had not been thought through completely. Thankfully, when I arrived today my first discovery was that the 2 inch bump from the bike path had been abated. Immediately I knew this was a good sign. Shortly, I found Laura Roumanos, who is the co-founder of Photoville, and she seemed pleased that I had made the effort to return. 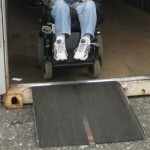 Laura offered to get the newly acquired portable ramp and assist me to get into the various exhibits in the cargo containers. We ended up having an interesting conversation as she gave me a guided tour of the installation.